There is nothing quite like the pitter patter of little hooves. These past few days have been crazy busy around the farm. We’ve welcomed four calves in as many days: two boys and two girls, one more adorable than the next. While an exceptionally beautiful experience, calving is also time consuming. I’m a bit of a worrier so Steve has had to humor me by joining me on early-morning/late-night treks, with flashlights in hand, out to the main pasture to check on the mamas that I think are close to delivery. We have been fortunate this week, as no mamas needed any assistance from us during their labor and delivery, but that doesn’t mean we haven’t had to work. The first few days are critical. We need to check on the herd regularly to ensure both mama and baby have bonded. If bonding fails, the mama will reject the baby and not allow nursing, so we stand out there to make sure we see each baby eating at least once a day. Newborn calves also have to be tagged and, if a bull calf, banded. Due to the amount of time we spend out in the pasture hanging with the herd, we have exceptionally friendly cows, which makes these tasks far easier. Tagging and banding have to be done within the first 24 to 48 hours post delivery. Tagging is relatively simple. I keep an eye on the mama and also hold the calf still while Steve tags each baby. Tagging is kind of like going to Claires for pierced ears, but with really cool yellow “earings” identifying who is the mama and what month/year the baby was born. Bessie’s baby was tagged B618. We have chosen to not raise our own bulls and instead will “rent” one when we want our cows to get pregnant. 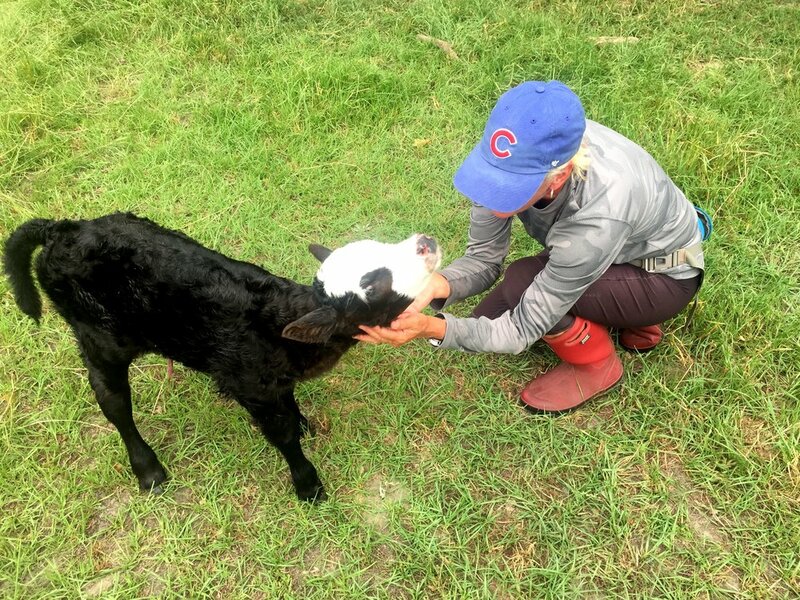 Turning a bull calf into a steer is done either right after birth, or several months later. I prefer right after birth because I think it is less invasive and more humane. We use the banding method. The banding process is something that will make every male reading this cringe and cross his legs. I hold the bull calf down on his side so those cute little testicles don’t go hiding on me, while Steve places a rubber band around his “package”. It doesn’t hurt, but will cut off circulation to the family jewels, causing them to shrivel up and fall away in a few weeks. Okay…..you can uncross your legs now gentlemen. What amazes me most is that Steve and I really can handle this stuff…..just the two of us! At times it is almost like we know what we are doing.